I'm overcome with emotion when I read and reread the letters of gratitude that I've received from old students who studied Aikido with me when they were young. 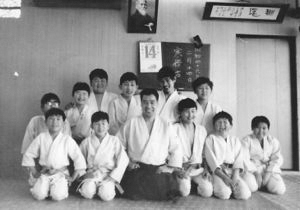 The other day, a person who practiced in the children's class right after the founding of the Kodaira dojo in April of 1969, was checking the dojo’s website and wrote me out of nostalgia. And last year, on September 20th, I turned 77 and received many congratulatory notes, some of these letters I would like to share. This first letter is from a man who wrote me on the occasion of my 70th birthday? I didn't make it public then, but wish to now. it is from a Mr. Satoh, formerly of Saitama University Aikido club. He is now a math teacher in a prefectural high school. I've instructed him at an affiliate dojo, the A&P Ishigaki dojo. I hope this letter finds you in good health in these cool days of Autumn. Congratulations on your 70th birthday and may you enjoy many more. Next year, I will retire and have many memories spanning these last forty years. I was introduced to Aikido by you when I was a student at Saitama University, practicing three years there, enjoying camps, and trips abroad where we had so many opportunities to practice Aikido with many people in Taiwan, Brazil, Argentina, Germany Sweden, Finland.....experiencing different cultures and eating delicious foods, enjoying superlative scenery all of which I am so grateful for. So many memories flood my mind, but I each memory, what stands out is your always smiling face. So much of what I have is thanks to you. I haven't had enough opportunity to visit you, for which I am sorry. Thanks to you, I have continued my career successfully. From here on as well, please show us the way. Good health to you in all your endeavors. 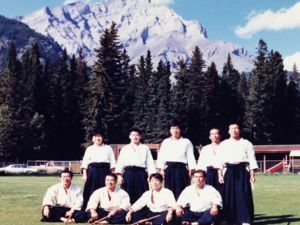 In this photo from Calgary, Canada, Mr. Satoh is standing in the back on the right. Seven years have passed, and I recently celebrated my 77th birthday. Again, I received quite a few letters and would like to share a couple. The following letter is from a Mr. Shimizu, who began in the children's class just after the opening of the Kodaira dojo in April of 1969. He says he checked the dojo’s website and was struck with nostalgic gratitude. he sent me the following letter along with copies of articles he wrote for PHP magazine: "Forward! ", "Words that inspired" , "A Grateful Heart" and "My Life Instructor." If anyone is interested in reading these articles, I can forward them. Here's the letter. Please forgive this sudden letter. My name is Shimizu, who learned Aikido from you when I was a sixth grader to when I finished junior high school. You probably don't remember me, but every now and then, I check the Aikido Kobayashi Dojo’s website. This last time, your kind, smiling face popped into view and I thought of writing this letter. According to the dojo timeline, Kobayashi Dojo was founded in April, 1969, about the time my father was transferred to Tanashi for his job. 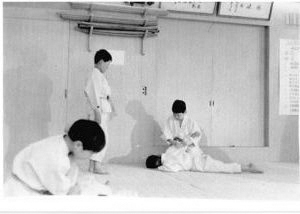 My younger brother and I both started practice in the children's class a little after the completion of the dojo in Kodaira and we continued training there for two or three years, until my father was again transferred, this time to Chiba and we had to stop practice. My father practiced in Hombu dojo and later founded the Aikido club in Mitsubishi Corporation. He was promoted to 7th Dan in 1990 and passed away eight years later. Kissshomaru Doshu attended his funeral. Just before my father's death, I recall hearing from him praise for your efforts in spreading Aikido. He went to Kobayashi Dojo every Sunday. I seem to recall that there were several people from Tanashi who also practiced at that time, including kids from my class. I just learned that you built the old dojo by hand. I can still recall that narrow entrance, the dojo's tatami, the sound of rain, my cold feet. I remember your son, Hiroaki, taking falls. The other day, I was going through a family album and found this old photograph, from Winter training Feb. 14, 1971. I was finishing my first year of junior high school. To your right (in the photo) is my younger brother and I am on the far right in the back row. Several people from this group have unfortunately passed away, but I wonder if the rest recall that warm, wonderful time with you and your smile, a time for which I will be forever grateful. These next two photos are from a demonstration, as you can see the demonstration program posted on the wall. .the boy standing is my younger brother. the bottom photo is of me doing tanto dori with Ando. You're standing to the side with some approval. I manage a math preparatory school in Chiba. Following your example of building a local reputation, the school has now grown to eight branches with a full time staff of 45, teaching over 1350 students. According to the Yomiuri Weekly, we're ranked 3rd in our placement rate. Because of our preeminence due to our graduates who have entered good universities, we are enjoying a good reputation around the region. I've come to better understand the words " we build success one step at a time." As a manager and though the different people I've worked with, I've learned a little more about how to walk the right path. The spirit of Aikido still helps me grow. Thanks to you, and even though our paths differ, that this kid who learned so much from you has accomplished something Is a tribute to you. Although I haven't achieved all that perhaps I could have, I look forward to the day I can report to you true success. Until that day, please take care. The next letter is from Mr. Kurihara from Meiji University club of 1970. After he graduated, he was employed by a major Insurance Company, and lived in the dojo, going to work every morning, a tough way of life. Now that he has reached retirement age, he is starting his second life. Sensei, you've celebrated your 77th birthday and I offer my profound and respectful congratulations. Even though it's been over forty years since you took care of us as students, I haven't sent you any greetings in all this time. After I was in Kobayashi Dojo for a year and eight months, you acted as a go-between for my wedding; at the Hino office, you came as a representative when I had just begun my career, for all of which I am grateful. I and my wife have both worked hard. In this spirit of respect, I am sending you a present and would be grateful if you receive this token of my esteem. I should present it to you in person, but don't have much free time. It is wonderful that you and your wife are able to travel abroad together. finally, I offer my sincerest wishes for your continuing health and good fortune. This photograph shows Mr. Kurihara at the same demonstration as Mr. Shimizu. This next letter is the most recent. it's from a Meiji University OB, Mr. Ogami, who practiced around 1975. At that time, drinking in the dojo and in rooms there was not forbidden, so after practices, or tests, students would throw a few back on the campus. The students would invariably drink too much and cause problems until finally, the head of the PE department called me. "The Aikido club again??" still rings in my memory along with the I age of my head bowing in apology so many times. Fortunately, I was never fired. You appear in good health; I was happy to see the bulletin about your activities and events. please continue in such good form. I'm grateful to you and Igarashi Sensei as well as my seniors from the Meiji club. Upon the return to my hometown, I became a politician and served four terms on the city council, and have been elected twice as mayor. My greatest joy now is seeing the faces of my two grand children (they are four and two; both girls). They are so cute. My younger son is single (32) and has just begun Aikido. We practice together and can talk father to son. He's practicing hard and is now a shodan. He'll need a wife soon. Our town has just opened a budo dojo of 80 mats (it used to be the dojo of the high school). Meiji students plan a camp here. I am very grateful for your gift of sake and will endeavor to work harder. As far as my practice is concerned, I took off four months for the election. Because I'm so busy, I don't have much time for Aikido, making to the dojo only once a week. As you may know, Yamaguchi sensei, 7th dan, the older brother of Hatayama sensei, was just transferred here and began teaching from December. I would like to continue Aikido at this albeit leisurely pace and would love to participate in your 45th anniversary festivities. I apologize for this late greeting and pray for your continuing health. 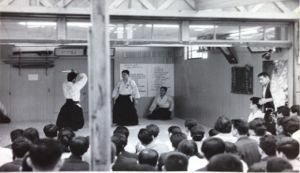 From the founding of Aikido Kobayashi Dojo, 45 years have passed. 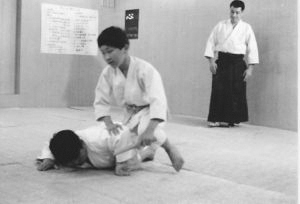 Throughout, we have persevered with the idea "from one to many--Aikido" Most of our instructors in Aikido Kobayashi Dojo, including Hiroaki dojocho, started their Aikido training in the children's class. They are now teaching aikido both here in Japan and abroad in our affiliated dojos in close to 30 countries. There are countless people who got to know each other at the dojo and made new families. Some of them are international couples. Lots of parents, couples, and even grand kids are practicing; truly this is wonderful. I am carrying out my life's mission of teaching Aikido. this year we will celebrate Aikido Kobayashi Dojo’s 45th anniversary in Kyoto with people from Japan and many participants from overseas. 45 years of success, with opportunities at home and abroad to practice and develop Aikido, I am resolved to make Aikido even better. I pray for your continuing support.